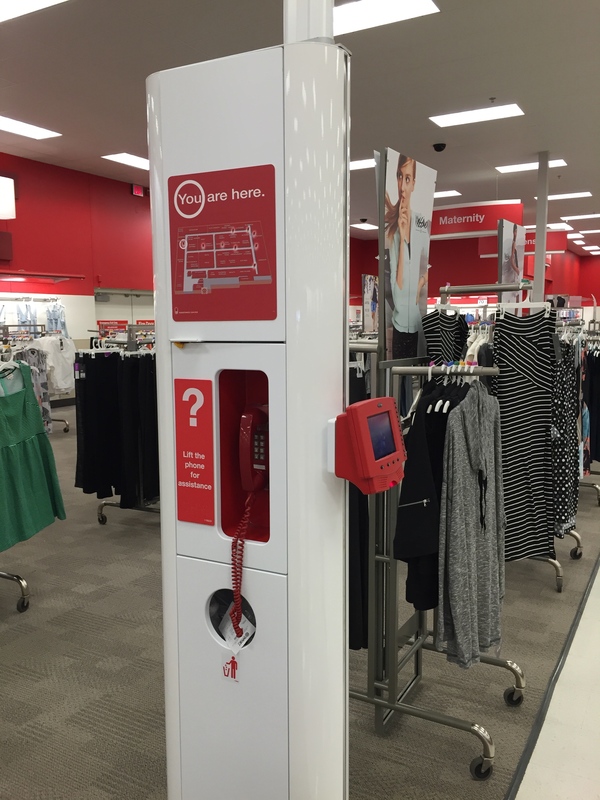 Target has a history of trying to keep their stores fresh, with user experiences and industrial design that is cohesive and friendly. 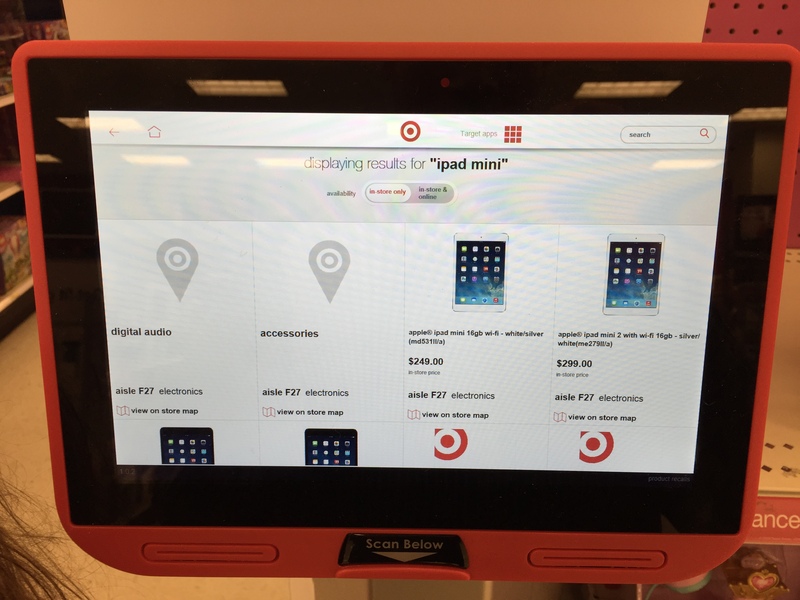 They don’t always succeed, but the latest changes have been interesting, as Target upgrades their in-store price check experience. It’s important to focus on delivering the features people need, and not more. 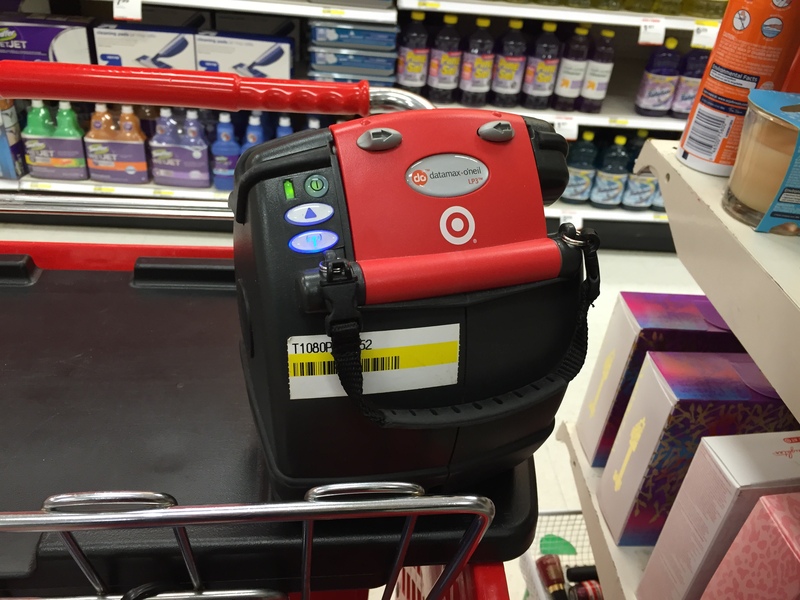 One area where Target is trying to improve the user experience is the price check scanners that are placed around the stores, usually at the end of aisles, next to a red phone. 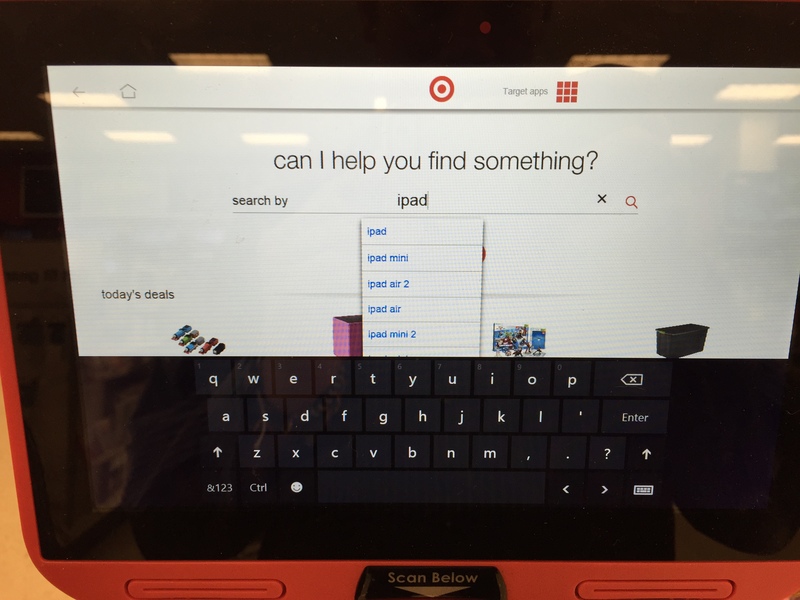 Target is no stranger to technology. 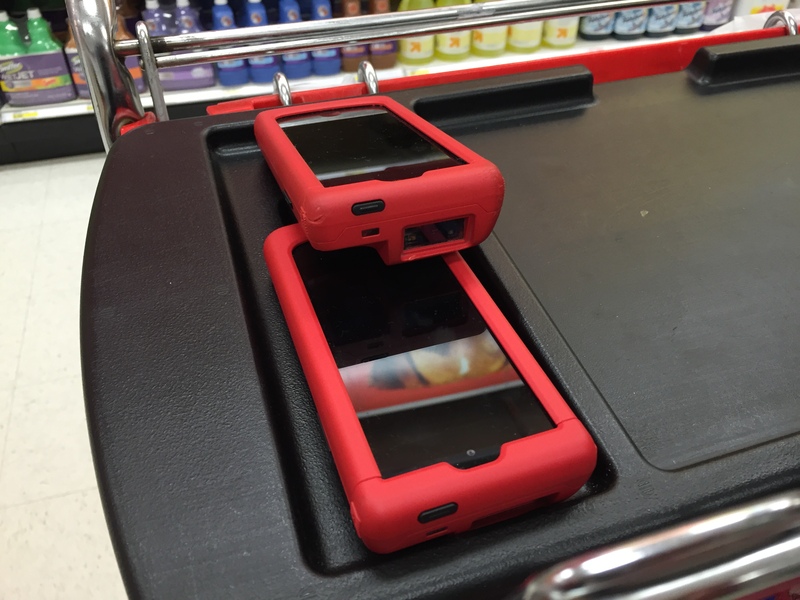 They use iPod touch in custom cases with barcode scanners built in to manage inventory and print tags for the shelf with a wirelessly paired printer. In the past, you’d walk up to the price check scanner, hold a product’s UPC code under the scanner and a low contrast black and white screen displayed the price of the item, what aisle it’s in, and whether or not there are more in the stockroom. 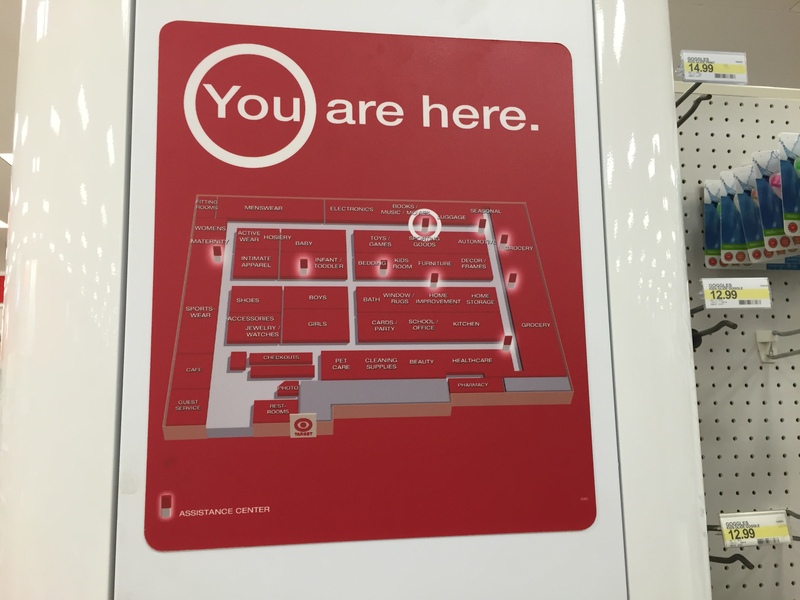 They’re placed strategically around the store, so that there’s never a far walk to one, and they have a red phone to reach a Target staff member and a map of where you are in the store. The new price check scanners are attempting to do a lot more. 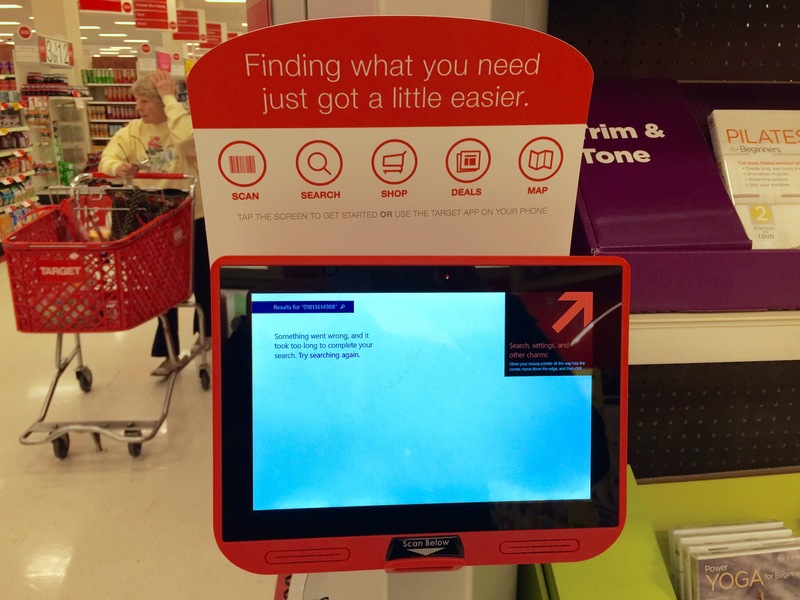 There’s new signage around them as well, encouraging store guests to find things, using the new tablet-based product, OR use the Target app on your phone. Scan, search, or… use your phone’s app. Scan. The good news is, the device is a full-color touchscreen, so it’s inviting, and far easier to look at than the old machine. 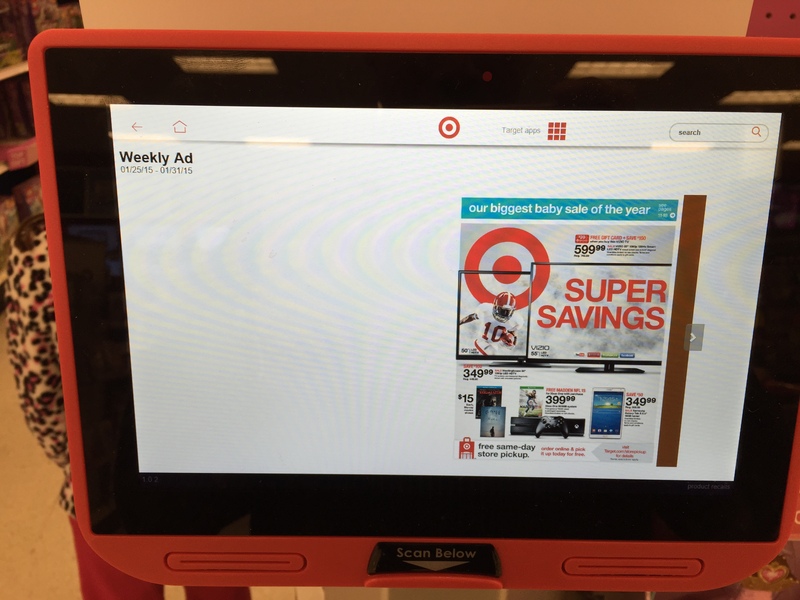 The downside is, most of the time, the screen is showing a tablet version of the Target app. Scanning is the most common use here, and as expected, when you wave an item underneath the scanner, it shows the same well-displayed price information as the old system. Search. 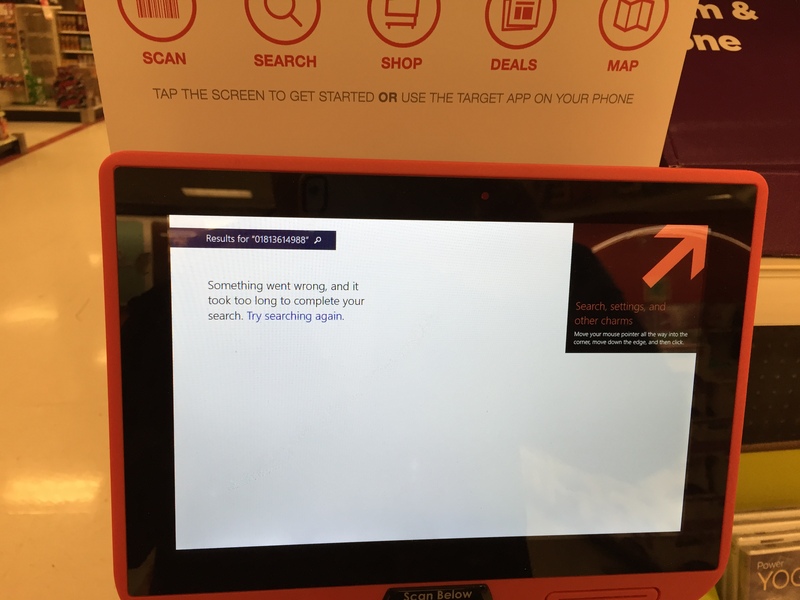 Search is a fine idea if you’re in store and need to find whether they have it or where it is, but as a guest I wonder how frequently this will really be used. Partly, this is because items tend to be placed well within their respective departments, and you can locate items by the department signs hanging from the ceiling, and then narrow down either by roaming two aisles, or looking at the signs at the end of the aisles. I can’t think of an occasion where I needed to know that an item was on aisle D39, or where that helped me find it faster. The old system provided this information, and I might have used it if I had found an item out of place in the store, wanted to see how much it was, and where I could find others in the store, but that need is really rare. Shop. I’m in the store. The hypothetical situation here is, I’m buying something, it’s not in stock in stores, but is in stock online, so I’d buy it from the price-check terminal? Target has a reputation of being really bad at shipping online purchases. This feels like feature creep, and was added in because it’s a full color tablet, so why not? Except, it’s probably a silly thing to have done. If you’re shopping online, do it from your phone or computer, certainly not their tablet. As a customer, I would never want to enter payment information into their tablet, while they’re going through upgrading the checkout registers to improve security, using chip-based readers. Deals. It’s nice to see if there are deals, but as customers, we’re inundated with them. There’s the weekly flyer, there’s mobile deals which can save to Apple’s Passbook, digital wallet and don’t forget to scan every item in the cart for a potential Cartwheel coupon. 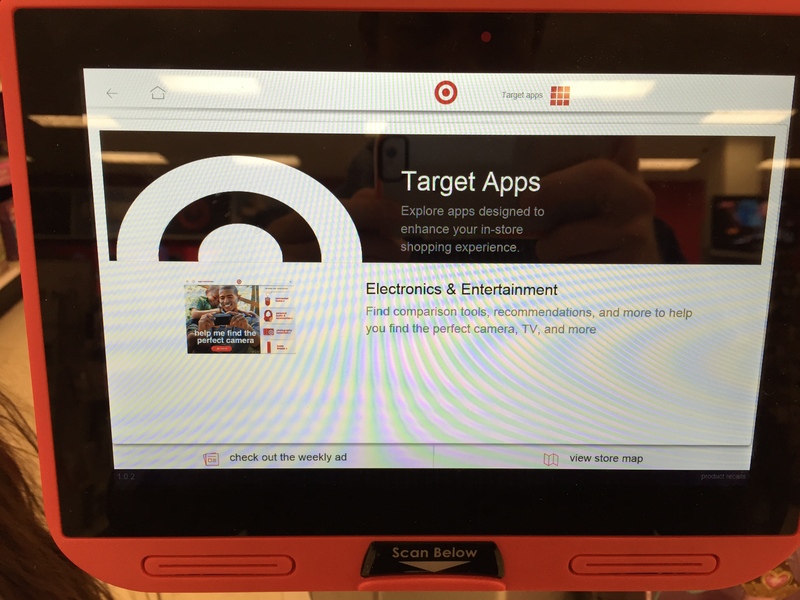 For some regions, Target is testing a third app, named “Target Perks,” too. Standing in front of the price check tablet to browse deals is probably something that doesn’t happen very often. Map. Finding items in the store isn’t a huge problem, given the large signs hanging from the ceiling to call attention to the different departments, but having the Map function is good, when coupled with the search function. Knowing that an item is on aisle G35 is not nearly as useful as the map with a path from the terminal to the appropriate aisle. Overall, I think the problems are, they lost sight of the fact that when you use this, you want to walk up, scan, and walk away. Deeper engagement is really weird, and it keeps other people from scanning items. When designing and implementing these sorts of systems, you need to take into account what’s going to be used most, and disregard the rest. You need to actively think about how long people will stand in front of the unit, and whether or not that’s uncomfortable as a guest. It turns out, it is a kind of uncomfortable feeling to use this thing for any length of time. Lastly, they’re in for a world of hurt in a power failure. The device takes 3 AND A HALF minutes to reboot, and when it does, it boots to a Windows 8 desktop with two shortcuts, one of which is the GuestHelp system. 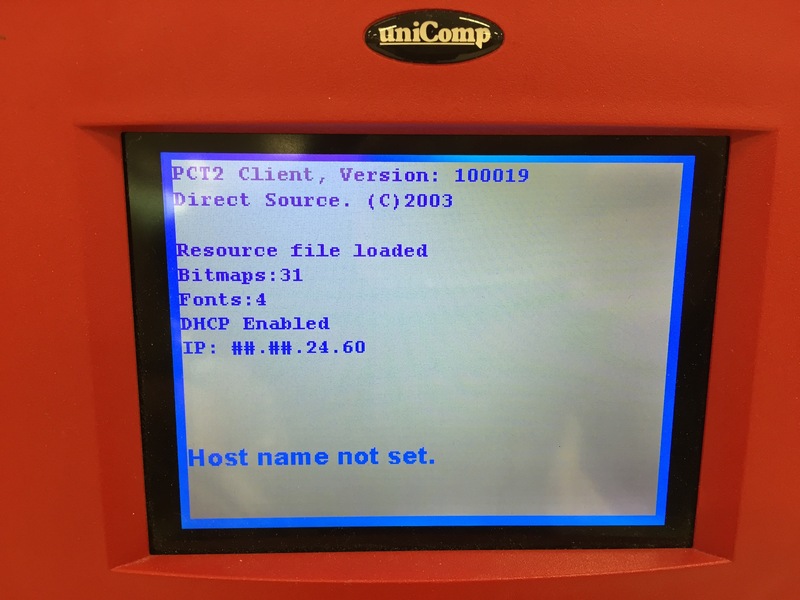 Once it’s arrived at this state, the touch screen is unresponsive and scanning an item causes the numbers of the UPC to be searched as if they were a filename on the local filesystem.The old one reboots quickly on power failure. The new model reboot process feels like an eternity while standing on the shop floor. Even after it reboots, it’s not usable. Interestingly, in this unusable state where it won’t accept touchscreen input, scanning a barcode causes it to recognize the numbers and attempt to search its filesystem for a match. This doesn’t work. 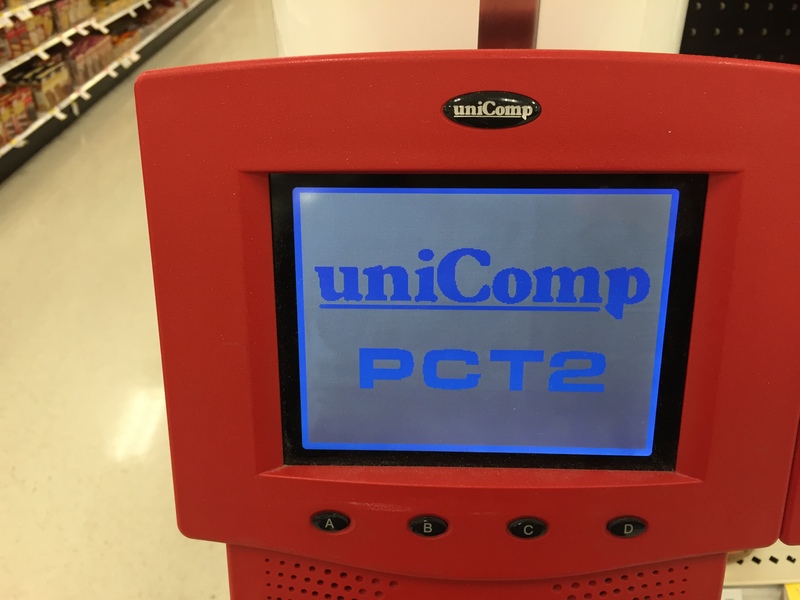 When walking through the store, we found three of the systems in unusable states, either this white Windows screen, unresponsive to touch, or the desktop with the two icons. They’re powered by the RJ45 ethernet connection in the post where they mount. Any interruption to that power source causes the long reboot and unresponsive state. These tablets are the opposite of the old price check experience – they go too far, without knowing what problems their guests really have. 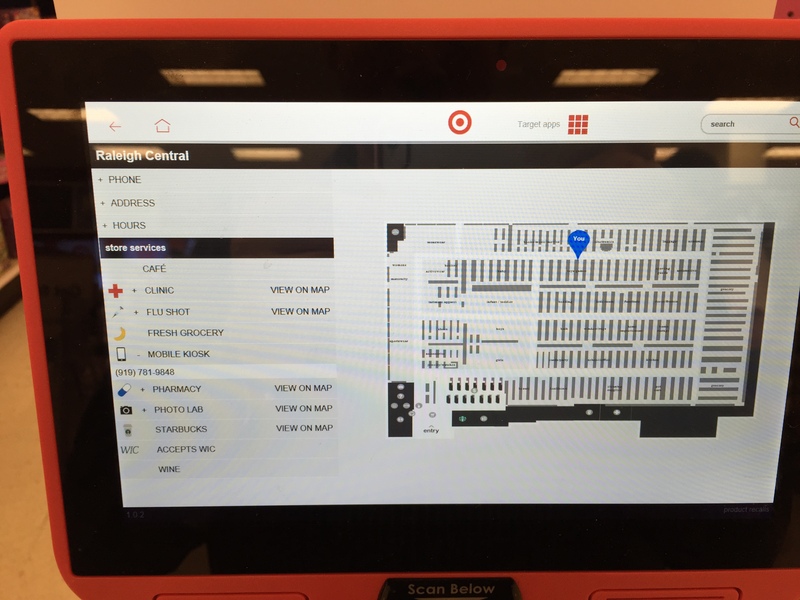 Are guests really trying to shop from terminals at endcaps?